Three weeks ago, I shared a video about the economics of trade balances. Here’s the next video in the Freedom Partner series, which looks at why trade (whether inside a nation or across borders) makes our lives better. Simply stated, we would all be miserably poor if we couldn’t trade. But when we can exchange with each other, we naturally begin to specialize in what we like and what we do best. 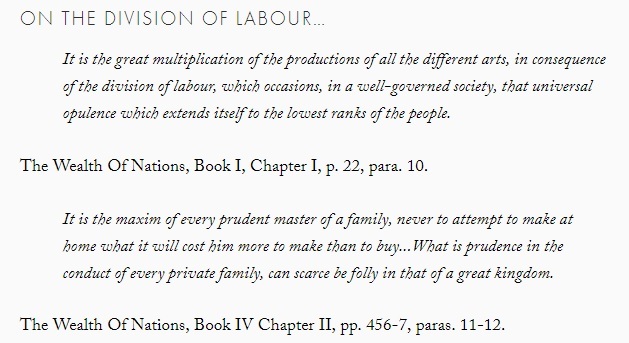 Adam Smith referred to this as the “division of labour” and he noted that this enables much greater prosperity. A related concept is comparative advantage, which is a way of illustrating how we become richer when trade enables us to focus on what we do best compared to others. Alan Blinder summarized this concept in a column for the Wall Street Journal. A snarky mathematician once challenged the great Paul Samuelson to name an economic proposition that is true but not obvious. Samuelson’s choice was comparative advantage, which shows, among other things, that there are mutual gains from trade even if one nation is better than another at producing everything. Here’s a homespun illustration. Suppose a surgeon is also a whiz at house painting—better than most professional painters. Should she therefore take time off from her medical practice to paint her own house? Certainly not. For while she may have a slight edge over most painters when it comes to painting walls, she has an enormous edge when it comes to performing surgery. Surgery is her comparative advantage, so she should specialize in it and let some others, who don’t know their way around an operating room, specialize in painting—their comparative advantage. That way, the whole economy becomes more efficient. The same principle applies to nations. Some of Samuelson’s observations over a lengthy and influential career were not so great, but his analysis about comparative advantage was spot on. This short clip from Matt Ridley also is a very good description of why we should trade and reap the benefits of comparative advantage. Last but not least, here’s a video from FEE on why specialization gives us so many great things. By the way, I cited a couple of studies in my video. The one showing 2-percent to 5-percent faster growth was published by the International Monetary Fund last November. Here’s part of the abstract. 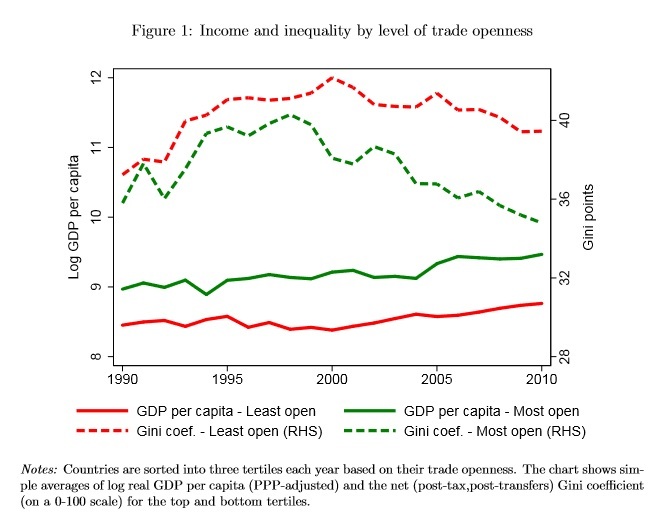 In the cross section of countries, there is a strong positive correlation between trade and income, and a negative relationship between trade and inequality. Does this reflect a causal relationship? We adopt the Frankel and Romer (1999) identification strategy, and exploit countries’ exogenous geographic characteristics to estimate the causal effect of trade on income and inequality. Our cross-country estimates for trade’s impact on real income are consistently positive and significant over time. And here’s the best chart from the study. It shows that pro-trade nations are both more rich (solid green line) and more equal (dashed green line). The moral of the story is that protectionism generates undeserved riches for the friends of politicians while lowering the living standards of everyone else. The other study is from the Peterson Institute for International Economics. Here are the key findings. We use four very different methods to estimate past gains. Each of these methods entails its own set of assumptions. Estimated annual gains are on the order of $1 trillion. The estimated gain in 2003 income is in the range of $2,800 to $5,000 additional income for the average person and between $7,100 and $12,900 for the average household. Future gains are harder to quantify, not surprisingly since the future is always difficult to predict. The estimates range from $450 billion to $1.3 trillion. 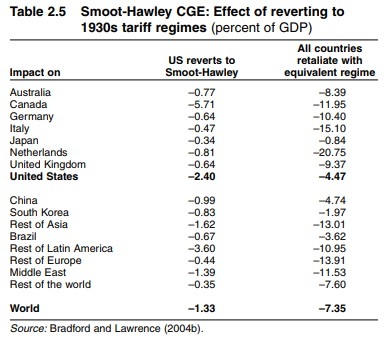 And my favorite visual from the study shows the negative impact of 1930s-style trade taxes. At the risk of understatement, repeating the policies of Herbert Hoover would be a very bad idea.